Please refer to our stock # 3234 when inquiring. 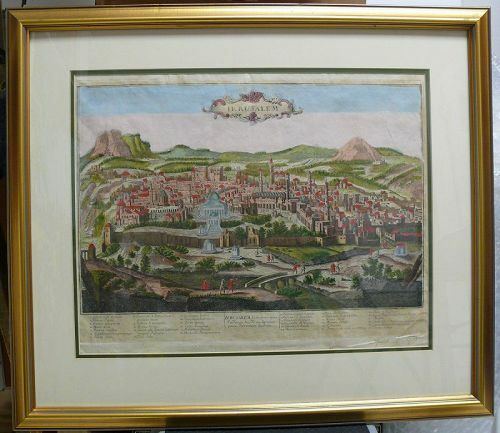 18th Century Copper engraving of Ancient Jerusalem. Previously owned and autographed in English and Hebrew by Teddy Kollek, first mayor of unified Jerusalem. Map is 16" x 20", frame is 24" x 28". In excellent condition. Theodor "Teddy" Kollek, May 1911 – 2 January 2007, was an Israeli politician who served as the mayor of Jerusalem from 1965 to 1993, and founder of the Jerusalem Foundation. Kollek was re-elected five times, in 1969, 1973, 1978, 1983 and 1989. After reluctantly running for a seventh term in 1993 at the age of 82, he lost to Likud candidate and future Prime Minister of Israel Ehud Olmert. During his tenure, Jerusalem developed into a modern city, especially after its reunification in 1967. He was once called "the greatest builder of Jerusalem since Herod.